Died: 3rd March 1921 – Ipswich. Enlistment Date: 23rd October 1900. Discharged: 13th April 1917 – Compound Fracture – Right Arm. 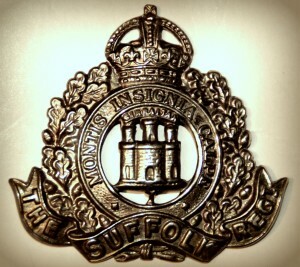 Regiment: Suffolk Regiment, 2nd/3rd Battalion. Medals Awarded: Victory, British War & 1914 Star + Silver War Badge. 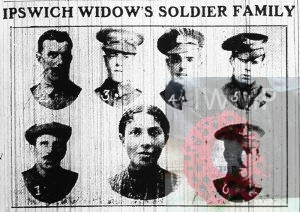 Relatives Notified & Address: Son of Elizabeth Carpenter, of 1a Salem Street, Ipswich. 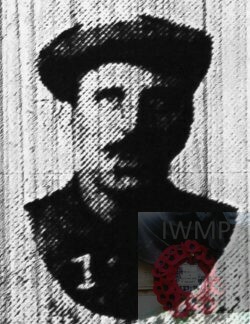 Brother to HERBERT SIDNEY CARPENTER & WILLIAM JAMES CARPENTER. Bryant was 7 years old and living with his parents & siblings. William James Carpenter, 10 months, born Ipswich. 1911 27, Kemp Street, Ipswich. Bryant was 27 years old, a General Labourer. He was living with his widowed mother, siblings & niece & nephew. (Nellie) Ellen Elizabeth Carpenter, 19, born Ipswich. Charles Frederick Carpenter, 17, a General Labourer, born Ipswich. George Rowland Carpenter, 15, an Errand Boy, born Ipswich. Herbert Sidney Carpenter, 12, born Ipswich. Albert Stanley Carpenter, 10, born Ipswich. Edna Elizabeth A. Hale, 3, born Ipswich. Frederick Victor Hale, 2, born Ipswich. Bryant’s father William James Carpenter, died 1906, Ipswich.